Today I was pleased to participate on a panel at the Municipal Climate Change Summit held by the Baker-Polito Administration to mark the one year anniversary of Executive Order 569, “Establishing an Integrated Climate Change Strategy for the Commonwealth.” The Order provides collaboration between the Office of the Governor, the Executive Office of Energy and Environmental Affairs, the Executive Office of Public Safety and Security, and key state, local and environmental stakeholders. Furthermore, the Order lays out a comprehensive approach to further reduce greenhouse gas emissions, safeguard residents, municipalities and businesses from the impacts of climate change, and build a more resilient Commonwealth. BOSTON – To mark the one-year anniversary of Executive Order 569, “Establishing an Integrated Climate Change Strategy for the Commonwealth,” the Baker-Polito Administration today held a Municipal Climate Change Summit to report on the ongoing implementation of the Order, announce several new climate change initiatives, and provide an opportunity for communities across the state to come together to learn more about the administration’s Municipal Vulnerability Preparedness (MVP) program. 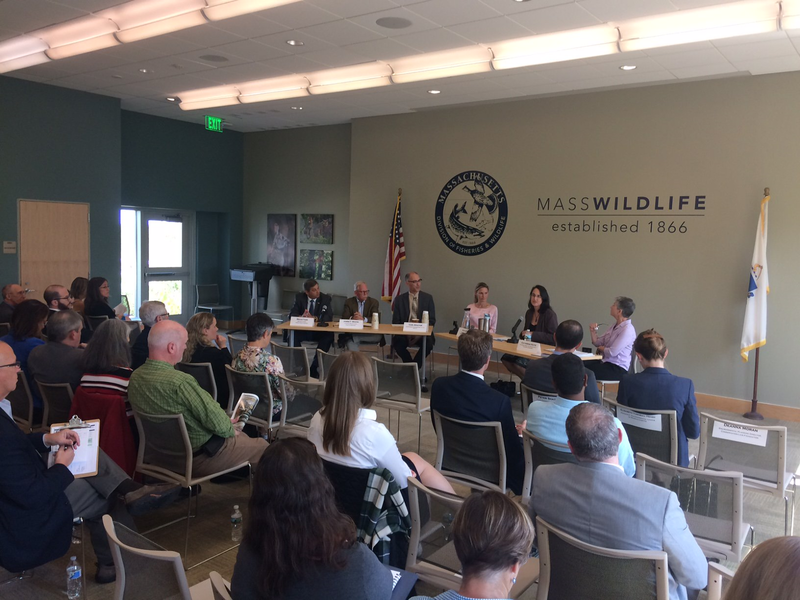 The Summit is part of Climate Week – a series of events to highlight Massachusetts’ efforts to prepare for and combat climate change and to celebrate the one year anniversary of Governor Baker’s signing of Executive Order 569. The Order, which builds on the administration’s nation-leading efforts to reduce emissions, lays out a comprehensive approach to further mitigate greenhouse gas emissions, safeguard residents, municipalities and businesses from the impacts of climate change, and build a more resilient Commonwealth. 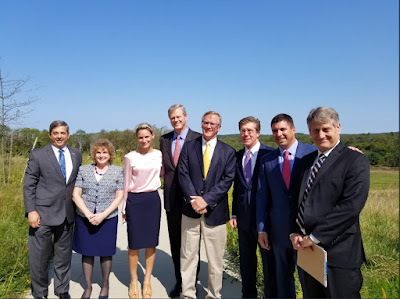 At the summit attended by over 150 municipalities, environmental advocates and other stakeholders, Governor Baker reinforced the Commonwealth’s commitment to reducing greenhouse gas emissions by announcing the Administration would work next to curb emissions from the transportation sector. To help the administration move forward on this issue, three public listening sessions will be held in the coming months for stakeholders from across the state to identify regional policies to reduce emissions, develop a comprehensive regional strategy for the deployment of electric vehicles, and discuss strategies to increase the resilience of transportation infrastructure. In an effort to continue progress towards the Commonwealth’s goal of 80 percent emission reductions by 2050, over the next year the Executive Office of Energy and Environmental affairs will work to establish an interim emission reduction target for 2030 pursuant to Executive Order 569. This process will be through development of the Clean Energy and Climate Change 2030. The Executive Office will work with the Implementation Advisory Committee of the Global Warming Solutions Act to study and set a target for 2030. Additionally, Governor Baker announced the release of statewide climate change projections developed through a partnership between the state and the Northeast Climate Science Center at UMass-Amherst. Working with scientists at the Center, the Commonwealth is releasing data that shows how temperature and precipitation will change over this century, data on coastal sea level rise and storm surge with coverage for the entire coast, and hydrological data to examine inland flooding in our river basins. The data will be freely available to the public on a new statewide climate change website to be launched this fall. At the core of the administration’s efforts on climate change is working to create a strong partnership between state government and our cities and towns who are on the front lines of climate change. Under the Commonwealth’s new Municipal Vulnerability Preparedness program, we’ve announced grant awards totaling over $1.1 million to 20% of the communities in our state. To help communities complete this program, our Executive Office of Energy and Environmental affairs, working in strong partnership with the Nature Conservancy has put together a training program and a new community resilience building guide that will walk cities and towns through the climate change projections and the planning process for assessing risk and identifying priority actions. This guide will be sent out to all communities who are enrolled in the MVP program in early October. Developing a vulnerability assessment framework and technical assistance programs for cities and towns and distributing over $1.1 million dollars to these communities to aid their efforts. In addition to the new regulations and last summer’s bi-partisan, comprehensive energy legislation, to further reduce emissions and accelerate state and regional efforts to combat climate change while continuing to grow the economy, Massachusetts worked collaboratively with eight other Northeastern and Mid-Atlantic states participating in the Regional Greenhouse Gas Initiative (RGGI) to finalize negotiations for a new program. The plan aims to reduce greenhouse gas emissions beyond 2020, and calls for an additional 30 percent cap reduction between 2021 and 2030, relative to the RGGI 2020 levels.